represents a generalized maximum extreme value distribution with location parameter μ, scale parameter σ, and shape parameter ξ.
MaxStableDistribution is also known as Fisher–Tippet distribution. 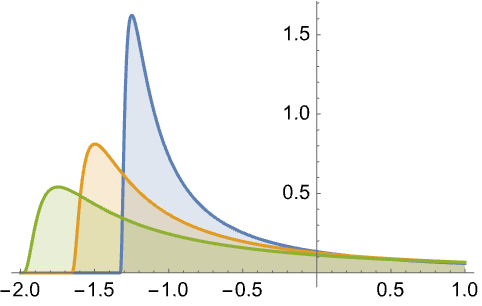 The generalized maximum extreme value distribution gives the asymptotic distribution of the maximum value in a sample from a distribution such as the normal, Cauchy, or beta distribution. The probability density for value in a generalized maximum extreme value distribution is proportional to for and zero otherwise. 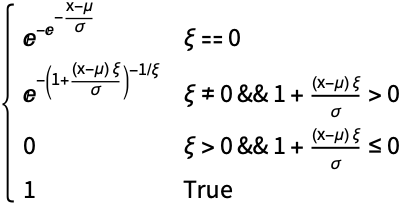 MaxStableDistribution allows μ and ξ to be any real numbers and σ to be any positive real number. MaxStableDistribution can be used with such functions as Mean, CDF, and RandomVariate. MaxStableDistribution[μ,σ,ξ] represents a continuous statistical distribution supported on the set of real numbers satisfying and parametrized by a positive real number σ (a "scale parameter") and real numbers μ and ξ (a "location parameter" and a "shape parameter", respectively). Together, these parameters determine the overall behavior of its probability density function (PDF). 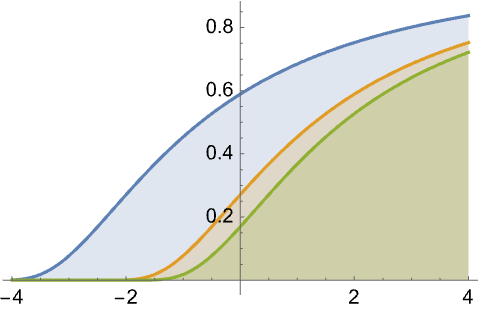 In general, the PDF of a max-stable distribution is unimodal with a single "peak" (i.e. a global maximum), with its overall shape (height, spread, and horizontal location of its maximum) determined by the values of μ, σ, and ξ. In addition, the tails of the PDF are "fat" in the sense that the PDF decreases non-exponentially for large values . (This behavior can be made quantitatively precise by analyzing the SurvivalFunction of the distribution.) Along with the min-stable distribution, the max-stable distribution is a so-called "extreme value distribution" and may be referred to as the generalized maximum extreme value distribution, a type-1 extreme value distribution (not to be confused with ExtremeValueDistribution), a Gumbel maximum distribution (not to be confused with GumbelDistribution), and a Fisher–Tippet distribution. 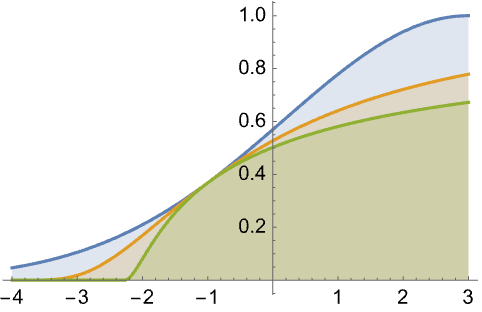 The generalized maximum extreme value distribution is the unique distribution modeling the asymptotic behavior of the maximum value in a sample from a distribution like the NormalDistribution, CauchyDistribution, or BetaDistribution. It was developed to combine the behaviors of other extreme value distributions such as the GumbelDistribution, FrechetDistribution, and WeibullDistribution. Because its PDF is doubly exponential (i.e. 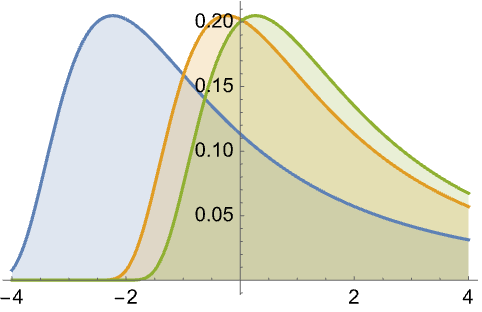 is of the form Exp[-Exp[…]]), the graph of the distribution has more exaggerated features (like higher peaks and thinner tails), a property unique among distributions. The max-stable distribution is a cornerstone in the field known as extreme value theory and is widely utilized to describe situations that are "extremely unlikely" (i.e. those in which datasets consist of variates with extreme deviations from the median). It been used to model a number of phenomena in various subfields of finance and economics. RandomVariate can be used to give one or more machine- or arbitrary-precision (the latter via the WorkingPrecision option) pseudorandom variates from a max-stable distribution. Distributed[x,MaxStableDistribution[μ,σ,ξ]], written more concisely as xMaxStableDistribution[μ,σ,ξ], can be used to assert that a random variable x is distributed according to a max-stable distribution. Such an assertion can then be used in functions such as Probability, NProbability, Expectation, and NExpectation. 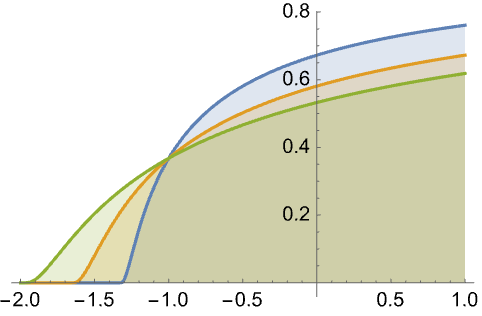 The probability density and cumulative distribution functions may be given using PDF[MaxStableDistribution[μ,σ,ξ],x] and CDF[MaxStableDistribution[μ,σ,ξ],x]. The mean, median, variance, raw moments, and central moments may be computed using Mean, Median, Variance, Moment, and CentralMoment, respectively. DistributionFitTest can be used to test if a given dataset is consistent with a max-stable distribution, EstimatedDistribution to estimate a max-stable parametric distribution from given data, and FindDistributionParameters to fit data to a max-stable distribution. ProbabilityPlot can be used to generate a plot of the CDF of given data against the CDF of a symbolic extreme value distribution and QuantilePlot to generate a plot of the quantiles of given data against the quantiles of a symbolic extreme value distribution. TransformedDistribution can be used to represent a transformed extreme value distribution, CensoredDistribution to represent the distribution of values censored between upper and lower values, and TruncatedDistribution to represent the distribution of values truncated between upper and lower values. CopulaDistribution can be used to build higher-dimensional distributions that contain a max-stable distribution, and ProductDistribution can be used to compute a joint distribution with independent component distributions involving extreme value distributions. 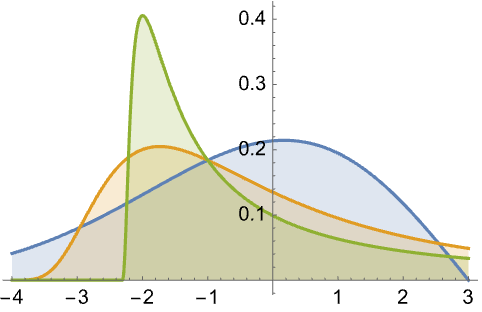 The max-stable distribution is related to a number of other distributions. MaxStableDistribution generalizes a number of distributions, including ExtremeValueDistribution (ExtremeValueDistribution[α,β] is the same as MaxStableDistribution[α,β,0]) and FrechetDistribution (FrechetDistribution[α,β] is precisely MaxStableDistribution[β,β/α ,1/α]). It can be transformed to obtain the distribution functions for MinStableDistribution, GumbelDistribution, and WeibullDistribution. MaxStableDistribution is also related to ExponentialDistribution, ExpGammaDistribution, and LogisticDistribution.